Last Friday, I introduced Harmony Circles to a packed room of Human Resource professionals from all across New York City. I had been invited to speak at the NYC-SHRM conference, to introduce some key concepts from the world of ADR (alternative dispute resolution), as they apply to business settings. ADR has been gaining attention and impact in many spheres of American life, and I was excited to contribute to its application in the business world, by way of discussing a unique application in the workspace. A few hours before I spoke, Johnny C. Taylor Jr. challenged the crowd with a fascinating discovery: that HR departments hold more power than they realize. The audience was both shocked and humbled by his call-to-action: to recognize the power HR holds and step up to the plate. He pointed out that HR is effectively in charge of who enters and leaves companies, and how people engage while there. They hold the keys to the corporate bank accounts of human capital. After setting this tone of empowerment, the HR professionals dispersed to breakout sessions to hear more about Workplace Violence, Unconscious Bias, and my own session on Performance Evaluation Circles. Each session highlighted opportunities for HR to drive healthier workplace dynamics, prevent turnover, and apply new, cutting-edge processes and systems. As I took the mic to introduce Performance Evaluation Circles, a hundred or so HR leaders packed a room to hear me speak. These HR leaders were taking a chance in attending my session: they had never heard of Circles, they weren’t sure what Circles meant, and the curiosity in the room was palpable. These were brave individuals, and they clearly showed open minds and hearts to a fresh, new perspective on what drives performance, growth, and innovation at work. I began by introducing basic human psychological needs and how they play out in the workplace. I invited participants to reflect on what truly drives productivity – that contrary to our current systems and/or assumptions, it’s not bonuses and promotions but rather meaningfulness and impact. Based on the response in the room, it was clear that HR leaders are aware that the current system is broken. They know that throwing money at people is no longer driving work ethic and productivity, but they had never been introduced to anything better, any alternative that could really make a difference. When we demonstrated the Harmony Circle process, the energy in the room clearly shifted. People were listening attentively and empathically. There was a vibe of understanding and compassion. And it was clear to both the Circle participants and audience alike that Circles promote the type of trust and collaboration that truly drive excellence, by establishing a Culture of Care. When we finished the demonstration and wrapped up the program, I chatted with a handful of participants who were especially moved by the experience. These were visionary leaders who recognized that Johnny Taylor was right about HR’s power in the workplace… and they were making an active choice to use that power to improve company culture with the help of Harmony Circles. Human Resource leaders do have the power to set the tone for truly meaningful workplace experiences. They can choose systems, like Harmony Circles, that honor the human spirit, tap into individual voices and perspectives, and promote respect and trust. By choosing to focus on the human side of “human capital” HR can drive companies to greater heights, promoting innovation, collaboration, productivity, and bottom-line profitability. 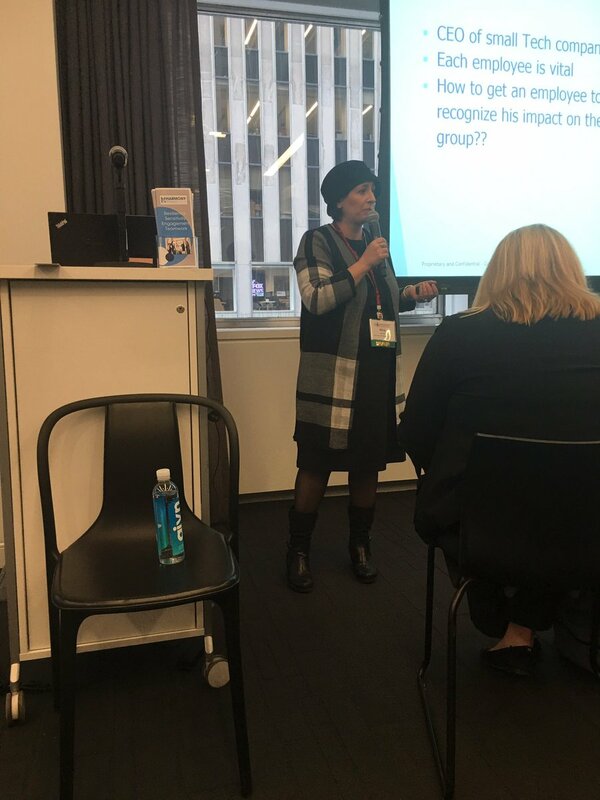 I was honored to share Harmony Circles at the NYC-SHRM conference and am hopeful to see how these HR leaders will apply Harmony Circles and related Restorative Practices, when they return to the office.